My question is very simple. 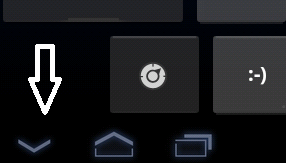 I just need to know what event this close keyboard button produces. I want to listen for the event and execute a simple method when the event is captured... I have searched many questions but all the solutions I tried was directed at other key events. I have researched this a little before and kept crossing conversations where people were saying that there isn't such an event to capture.